LONDON (Reuters) - British Prime Minister Theresa May will address her Conservative Party lawmakers at a private meeting in parliament on Wednesday, her spokesman said, as she seeks to calm growing tensions over her Brexit strategy. May will appear before the party's so-called "1922 Committee" of backbenchers in parliament, where she can expect a rowdy crowd and difficult questions. How she goes down with restive lawmakers, some of whom would like to topple her, will be closely watched. She herself asked the committee's chairman if she could address the meeting, her spokesman said. Earlier, the Sun newspaper's political editor Tom Newton Dunn had posted on Twitter: "Interestingly, May was not summoned to attend tomorrow - but has herself asked to go. This must mean the Chief Whip (party organizer) is confident of pulling off a choreographed show of loyalty." With just over five months until Britain is scheduled to leave the EU, Brexit talks have stalled over a disagreement on the so-called Northern Irish "backstop", an insurance policy to ensure there will be no return to a hard border on the island of Ireland if a future trading relationship is not agreed in time. May again failed to clinch a deal at an EU summit last week and her decision to signal the possibility of extending a post-Brexit transition period, keeping Britain under EU governance with no say in it, to help end the deadlock has angered both hardline supporters of Brexit and pro-EU lawmakers. Britain's Sunday newspapers were full of anonymous attacks on her, the violent nature of which have since been condemned by even her harshest critics. 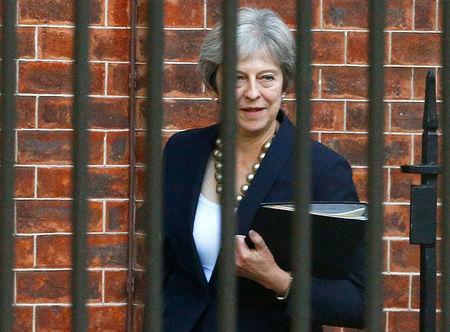 One said May was entering "the killing zone", while another said May should "bring her own noose" to the 1922 committee meeting. A vote of no-confidence in May would be triggered if 48 Conservative lawmakers submit letters to the chairman of the 1922 committee to demand such a vote. The Sunday Times said 46 had now been sent, but Reuters could not verify that number.